4 Bedroom Luxury Property with secluded hot tub & games room, sleeps 9. Hazleglade, Saundersfoot, is a large Luxury self catering Bungalow with Hot Tub and fully equipt games room and outdoor table tennis table. Sky TV has been installed with access to Cinema and Sports package. A brick built BBQ has been added for use with disposable BBQs only. sleeps up to 9 (4 Bedrooms). 3 kingsize, 1 double and 1 single bed, 2 bedrooms with en-suite, 1 family bathroom and separate cloakroom with w/c. Hazleglade is situated on a large private plot within a 5 minute walk to the beach all on the flat in the lovely Welsh village of Saundersfoot. This popular Pembrokeshire fishing village and seaside resort boasts an award winning blue flag beach, traditional shops, pubs and restaurants and only a few miles away from the larger town of Tenby. It is an ideal base for taking in Pembrokeshire’s stunning beaches, costal paths and the wonderful countryside within the Pembrokeshire National Park. Hazleglade has been fully renovated, and lovingly transformed into a modern self catering house with stunning bathroom and en-suite facilities not to mention a dream bespoke kitchen. This property oozes luxury even down to the quality of bed linen and towels. With Free WiFi. We welcome well behaved pets (max 2) and ask that your pets are not left unattended unless you are equipped with a secure cage for the animal while you are out to minimise the risk of damage to the property. We have been holidaying in Saundersfoot for over 30 years, the third generation of our family enjoy it just as the first. Over the years we have stayed in many different properties. We feel our experiences have put us in a great position to know what facilities our guests will be looking for plus a few luxury extras to make your holiday special. We have aimed to give you every home comfort and following our own holidays in the property, we feel that you will not be disappointed. We had already fallen in love with Saundersfoot so when we found this property we knew we could make it a fantastic family holiday home and rental property. Following our own experience of staying in rental properties we had found Saundersfoot to be quite hilly and this made it harder to get around with a pushchair and elderly relatives. Hazelglade gives you the opportunity to reach the Strand and the beach all on flat terrain. The garden at Hazelglade is very generous, peaceful, private and benefits from a sunny and light position. As we have our young grandchildren at the property it is important for us knowing the garden is safe and secure for them to play in. We installed a brand new hot tub in 2014. it is great to come back to this following a day out at the beach, one of the many local attractions, or after one of the numerous walks available within the Pembrokeshire National Park. Our grandchildren are the inspiration behind us converting the garage into a fun filled games room, it gives young (and old) plenty to do whatever the weather and is an extra space away from the main living area. In September 2015 we added an outdoor table tennis table to add another perk to your holiday experience in Hazelglade. The addition of Sky TV with cinema and sports package and brick built BBQ for use with disposable BBQs only have been added in 2018. All linen is provided but we insist guests bring there own beach towels and separate towels for use in and out of the Hot tub. There is off road parking for up to 4 vehicles if you park with care. For use in the house only. Please provide your own towels for the hot tub and beach, thank you. Please note the Hob is an induction Hob and will only work with the correct pots and pans which are provided. If you wish to bring your own then please make sure they are compatible. The Hot tub provides guests with the opportunity to relax after a day out. There are guidelines for Hot tub use which I insist all guests read prior to entering the Hot tub. Lovely accommodation close to Saundersfoot harbour. Everything you needed was available in the accomidation. Comfortable bedrooms and facilities. Hot tub was lovely and very large. I got engaged while we were away which was a massive suprise and bonus. I’m sure we will be back in the future. Thank you for a lovely welcome gift! Beautiful property perfectly situated in Saundersfoot, close to beach and all amenities . The bungalow was perfect for our family birthday celebration weekend. We found Prosecco and chocolates in the kitchen, a lovely surprise. The hot tub and games room were a huge hit with all the family, those who didn’t venture in the hot tub put their feet up and watched Sky tv, sports and movies. The open plan kitchen, diner and lounge was great. The kitchen had everything you could possibly need and so much crockery and cutlery we only needed to put the dishwasher on once at the end of 4 days. The bedrooms were beautifully decorated, all soft furnishings exquisite. The beds were so comfortable and plenty of room for baby travel cot. To have en-suites, family bathroom and separate loo was fantastic, this is an essential criteria when choosing a holiday home for us as a family. The bed linen and towels were of a very high standard, and plentiful. Between booking and arrival I had emailed the owner on several occasions with questions and he was brilliant, on our arrival we met property manager and he was very helpful too. I would thoroughly recommend Hazelglade to anyone and would certainly return. Stayed for a week with our adult children. Lovely place and great location. Facilities also very good. Hot tub is heavenly! Addition of Sky TV was a huge plus on the one rainy day we had. Games room and hot tub were fantastic and the short flat walk to the beach was perfect for young and old family members. Bungalow was very clean and well presented, everything catered for. Welcome pack was well received, bubbly didn’t last long!! brilliant,served it's purpose perfectly as base camp for our Pembroke tour.fantastic house with plenty of room for everyone including the 4 kids and our little dog,could not fault the accommodation.The games room really helped to occupy the kids whilst preparing for the day ahead and the hot tub certainly finished them off when we got back,and once they were in bed what a way to end the day,in the tub ,cold beer watching the footy on the tele,perfect!! This house could not be better situated to take advantage of the village,beach and harbour.It would be fair to say you will never go hungry in Saundersfoot the food is great and not over priced and what a variety. our favourite really was the early morning walk on Coppet hall beach,little dog loved it, the kids loved rock pooling and i personally liked a morning swim in the cold but very clear water. What a week we had,I loved it, but not as much as my kids aged 3-11, dog aged 4 and wife 30 something and me 43. A great location with easy access to the centre of Saundersfoot. Elderly parents found the flat walk to the centre manageable down a footpath and noted easy for mobility scooters. All enjoyed the table tennis and games room. A great addition for the evenings entertainment. 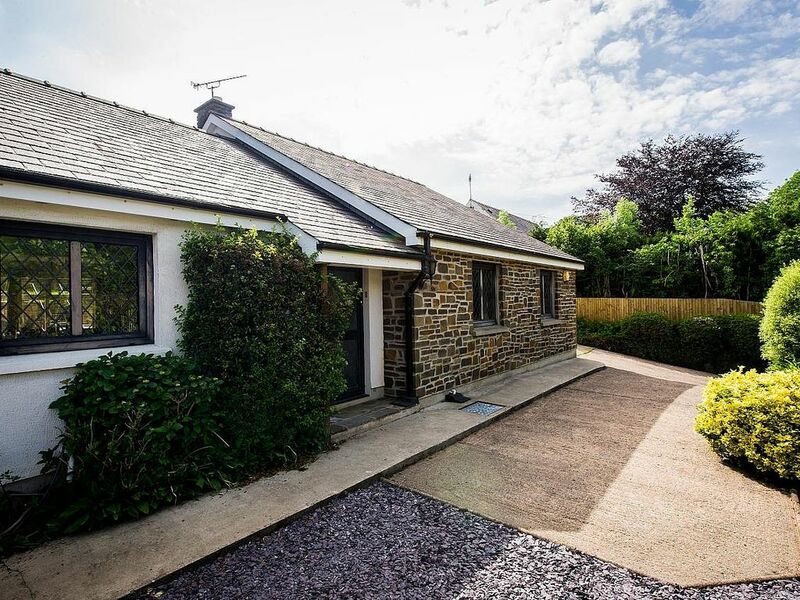 Hazleglade is situated on a large private plot within a 5 minute walk to the beach all on flat terrain in the lovely Welsh village of Saundersfoot. This popular Pembrokeshire fishing village and seaside resort boasts an award winning blue flag beach, traditional shops, pubs and restaurants and only a few miles away from the larger town of Tenby. It is an ideal base for taking in Pembrokeshire’s stunning beaches, costal paths and the wonderful countryside within the Pembrokeshire National Park.